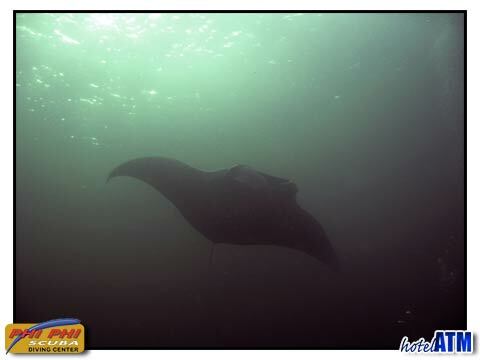 Whales sharks and other large pelagics like Manta Ray come to Phi Phi Island every year. They are rerlatively rare though: my luck is not in as in 15 years of scuba diving off Phi Phi Ley and Koh Bida I have never had the chance to encounter one. However last year I met someone who had just completed her PADI open water and she saw a 4 meter Whale shark at Phi Phi Koh Bida on her first open water dive during her course. Some say it is luck, some describe the whale shark’s levels of sensitivity that make them happy around some divers. True or not, all I know is that on Phi Phi I have not seen a whale shark at any of the local dive sites. The whale shark, Rhincodon typus, is a filter feeding mammoth that grows from 3-14m almost 55 ft. The whale shark doesn’t swim fast but effortlessly ploughs forward with easy movement. With it’s mouth wide open in the warm seas of Phi Phi, the whale shark consumes the phytoplankton, macro-algae, plankton, krill and small nektonic life, such as small squid or vertebrates in. This micro organisms make for poor for visibility of divers but a good source food for whale sharks. Whale sharks are not a threat to divers unless the diver is unintentionally struck by the tail fin and there are reports abound of whale sharks playing with divers. Some divers have been known to scrape the parasites of the whale shark something they are more than happy to enjoy. Phi Phi whale shark sightings are monitored by all the dive Instructors and dive masters and if you go into any Phi Phi dive centre you will find out where and when these beautiful creatures were last scene. Most dive centers see whale sharks 4-10 times a month in the December to April window but it does seem to be a matter of luck if you are on that exact trip. However some dive masters do seem to have a thing going for them, they are more acutely into “spotting the whale shark” and with this kind of attitude you are more likely to not miss a sighting when you go with that person. 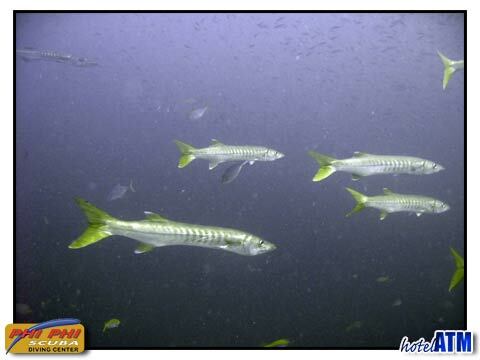 The most sightings seem to be on Koh Bida, shark point and further south at the remote diving rock of Hin Muang. The whale shark is seen at Phi Phi ley under the western walls but less so on Phi Phi Don. There are very few sightings on the east coast of Phi Phi. Phi Phi Island is a world class diving destination and the whale sharks that visit every year can make a diving experience the highlight of their time in Thailand. It is foolish to say you will see a whale shark every fun dive you make but let’s just say... if the whale shark want to make your day, they are certainly out there in numbers.